One of the clearest signs of late stage bull markets is when you do a double take at seemingly attractive value propositions in high quality stocks. Take asset management firm T. Rowe Price (NASDAQ:TROW) for example. If you were looking at the stock for the first time, with no clue as to its history or business, you’d probably start off with the basic tests that you’d apply to any stock. Broadly speaking those would be based around earnings quality, financial health, growth and possibly the dividend history if you were looking at it from an income perspective. Finally, you might also check out the historical investment returns just to provide some validation that it has a track record of solid wealth creation. Once you satisfy yourself on those basic criteria you’d then look to see if it was trading at a suitable valuation. It kind of goes without saying but at this stage of the market cycle this is the bit that’s the kicker. There are plenty of high quality names out there deserving a place in a long-term portfolio but hardly any of them are trading at attractive valuations these days. 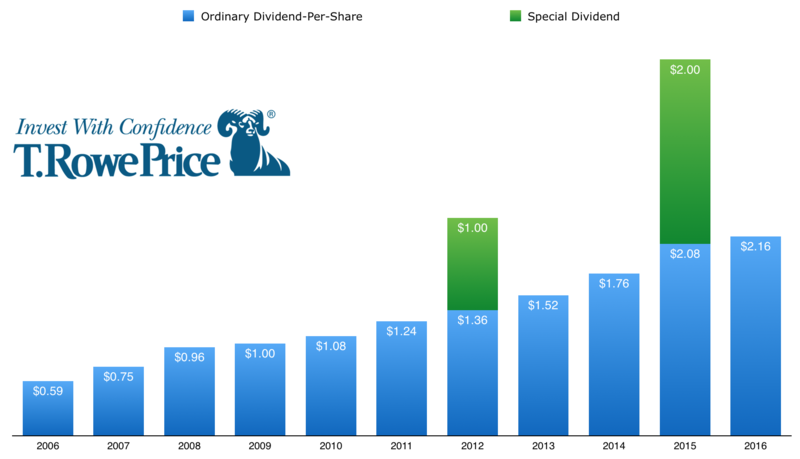 This is why T. Rowe Price stock looks to be a solid proposition at around 17x earnings and a 2.85% dividend yield. As a money manager offering a variety of mutual funds the company earn a slice of their total assets-under-management (AUM). The more AUM, the more T. Rowe Price will earn in fees. The upshot of that business model is that margins tend to be predictably fat, even in times of economic turmoil. 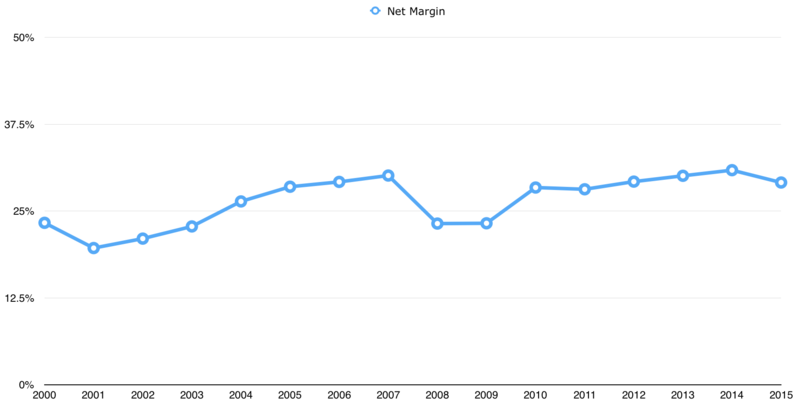 In 2009 for example, which was their worst year of the crisis from an earnings perspective, the company still managed to post a net profit margin of 23%. The only downside is that during economic slumps revenue and earnings tend to follow as suit as investors withdraw cash and total AUM drops. The net result is that it gives the business a bit of a cyclical slant. For example, following the dot-com crash and subsequent bear market revenues fell by around 20% and earnings-per-share by 25%; an in 2009 earnings-per-share were around 30% lower than they were in 2007. That’s just part and parcel of all finance stocks; they’re inertly cyclical. Though as I mentioned above the fact that margins tend to remain so strong even during downturns indicates it isn’t really an issue with the economics of the underlying business. In other words if the upshot of the worst economic crisis since the Great Depression is that you go from being an obscenely profitable finance company to a slightly less obscenely profitable finance company then you’ll probably be okay over the long-run. As for financial health it has become quite easy in this dividend stock bull market to neglect looking at the balance sheet when you’re dealing with super high quality earners and record low interest rates. That’s why I’d always give a stock like Johnson & Johnson extra consideration when it’s fairly valued because the huge amounts of net cash they carry gives them added flexibility. If they identify a smart acquisition they can go for it, or carry on bumping their annual dividends upward during periods of low earnings growth. In the case of T. Rowe Price the fact the company sport zero debt with about $1.4 billion in cash and short-term investments helps to smooth the cyclical hit that earnings take when markets slump. For example, when earnings dropped by 25% during the early-2000s bear market the per share dividend distribution went up by over 20%. Likewise during the financial crisis when the dividend rose from $0.60 per share to $1.00 per share between 2007 and 2009, despite earnings-per-share slumping from $2.40 to $1.65. More recently they’ve initiated a couple of special dividends (one for $2 per share in 2015 and one for $1 per share back in 2012) such is the extent of the cash generation and balance sheet strength. The point about the cyclical nature of certain stocks means you have to look back over a suitable stretch to obtain a fuller picture of what an investment might look like over the long run. Over the past fifteen years we’ve experienced a couple of bear markets and booms which gives us at least one complete cycle to look at. In that time the company have seen annual revenue-per-share increase from $4.15 to around $16.25 and earnings-per-share rise from $0.76 to around $4.50. That works out to 10% annual revenue growth and 12.50% annual earnings-per-share growth respectively. Oh, and the dividend has also risen by around 14% annually over that frame. The last time T. Rowe Price failed to increase their annual distribution to shareholders? Sometime in the mid 1980s. For a finance stock that is pretty good going. All of this feeds in to where the stock is today. Currently shares are trading on the market for about $76.50 on estimated 2016 earnings of around $4.50 per share. That puts it at bang on 17x earnings. Given that an investment in T. Rowe Price stock would’ve compounded your wealth at a rate of around 17% per year had you invested thirty years ago I find that an extremely attractive place to be. Why? Because going forward you’ve got the earnings multiple on your side to the extent that you can afford to be conservative with your long-term growth estimates once you factor in the current 2.85% dividend yield. Let’s say that over the next decade earnings growth comes in at half the rate seen over the prior decade. That would add around 7% a year to the share price assuming a constant value multiple. In addition you could also conservatively assume that the current $2.16 per share dividend will at least match earnings-per-share growth going forward given a payout ratio of just under 50%. Even though there is scope for that pay-out ratio increase it seems prudent for management to keep it lower than it might otherwise be given the cyclical nature of asset management firms. Over the next ten years you could therefore reasonably expect another $28.50 per share to dished out by way of cash dividends. All-in-all that would add up to a hypothetical total return of 9% per annum over the next decade. Let’s call it 10% once you include the effect of reinvesting those dividends along the way. Compared to the likely forward returns of the S&P 500 and the other richly valued dividend aristocrats then I’d say that looks like an attractive proposition.